So here I am, safely installed in a delightful airbnb very close to the centre of Winchester. I have a Festival Pass in my hands and I’m going to make the most of it. I’ll report back, in between attending events, starting with a few things I went to yesterday. The opening event was a workshop by Michael Laskey called Be Your Own Editor. 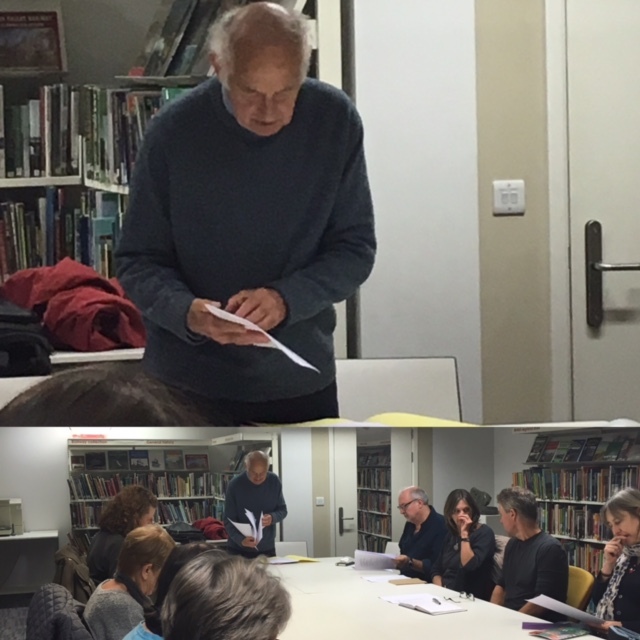 Not surprisingly, the workshop was sold out because the chance to have Michael read and give feedback on one of your poems is not to be missed. Very good handouts were supplied at the start of the workshop, including Simon Armitage’s Top Ten Tips – ten useful questions to ask of a poem. These included “The Eye Test: How does it look on the page? Has some thought gone into its shape? Does the form bear some resemblance to the content?” Michael recounted Pascale Petit telling him that when she edited Poetry London and read thousands of submitted poems, she knew as soon as she saw a poem on the page if it was going to be something she might want to publish. 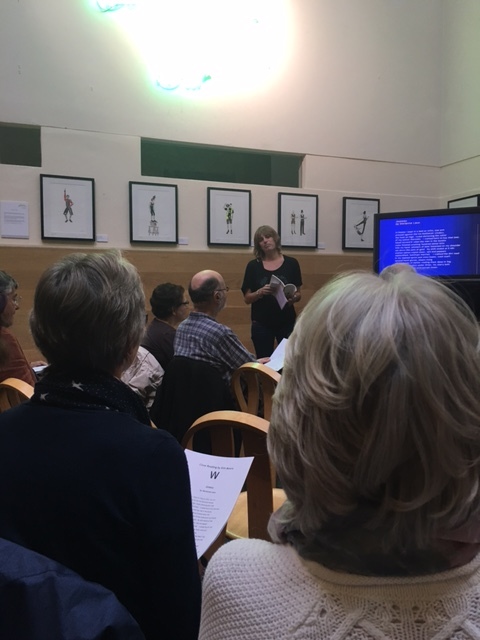 Each member of the Winchester workshop had emailed a copy of one poem to Michael and he’d photocopied them for the whole group to ‘edit’ in a round the table discussion. I like the language Michael uses to constructively criticise a poem: “What’s nice about this poem?” “Does it ring true?” “Does it have lines or phrases that stick in the memory?” Then, thinking about what’s not quite working: “Where are problems?” There were brilliant contributions from participants and some very experienced poets in the group. There were two Close Readings on Day One by poets who are appearing at the festival. 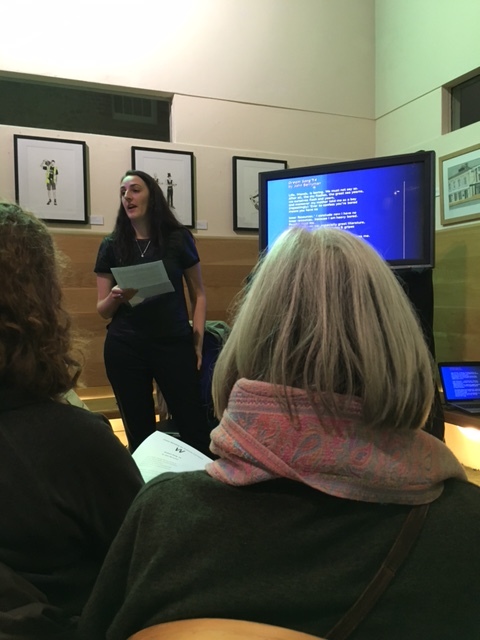 Close Readings are free, 15 minute sessions, during which the poet gives a talk about a poem that has influenced or inspired them or they find particularly interesting. Kim Moore chose Juneau by Dorianne Laux. It’s the speaker’s mother who dispensed this adage. Rather than acting upon it, the speaker accepts his mother’s opinion which Frances finds particularly brilliant. as if the speaker’s boredom means he can no longer see the difference between mortal danger (suggested by ‘plight’) and a slight problem (a ‘gripe’). We also considered the gesture of childish disrespect in refusing to give Achilles a capital letter, as if the child who was told he mustn’t be bored is asserting defiance. I found both close readings fascinating and helpful. I’m really glad the festival has included them in the programme and will be attending as many as possible. More soon. Lovely to to see you yesterday. Hope you enjoy the rest of the fest! Wish I was there again today. Do you know the title of the Alaskan poem that was closely read btw?